The sister art forms of dance and film have much in common. At its core, cinema is about movement, light, timing, and story. When successfully combined, the two forms can enhance one another’s power. This past week, Seattle audiences were treated to dance films that do just this. A carefully curated selection showcased filmmakers and dance artists—especially those making work in the Northwest—who are exploring place, technology, and history with an enlivening set of new dance films. In a joint effort, Next Dance Cinema (part of Velocity’s annual NextFest NW) was curated with the theme NEW WEST by Velocity’s Artistic Director Tonya Lockyer, Stranger Genius Award winning artist Rodrigo Valenzuela, Northwest Film Forum Program Director Courtney Sheehan, and accomplished choreographer, dancer, and filmmaker Dayna Hanson. Under this year’s NextFest NW theme, artists brought a critical post-recession lens to identity in the New West. 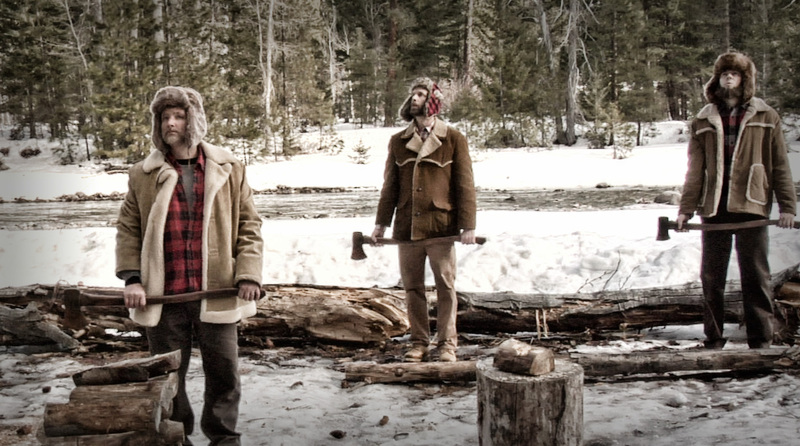 High production value and creative artistic direction are used to good effect in these films; fake beards, angel wings, hatchets, and itchy sweaters tell a complicated story. The Tuesday, December 9, program presented a number of beautifully constructed images that attest to the possibility of dance cinema. In Jennifer Keller’s Ferry, a single dancer, mysteriously dry, balances on a wooden pole in the sea as the tide rises around her. Birds in Warped Time (Carolyn Pavlik) features a ghostly presence in an old farm house laid bare. Some of the pieces, like the pop-art, primary-colored Chroma (Jeremy Moss) and micro-short Small Itch (Deana Peters), ease the transition from dramatic stories told through dance into more lighthearted subject matter. Angel Crush (KT Niehoff, with Sebastien Scandiuzzi) toys with queer desire amidst the stately columns that separate downtown Seattle and Capitol Hill, as well as angels and mortals. Dancer Hazel Morris moves with the fluid grace of a mermaid weighed down by sunken treasure in Juliette Machado’s Loops and Tides. Here, video editing defies audience predictions as the waves of Alki beach roll in. A rodeo center is the setting for Pavilion, another collaboration between Seattle ex-pats Adam Sekuler and Shannon Stewart. Its setting and equine movements recall Kathi Prosser and Caroline Richardson’s Horse. Found audio of rodeo sportscasting laid over Stewart’s descriptive dancing create an eerie sense of festivity and danger, characteristically western, yet sparse. One of the most promising shorts offered a field of dreams with more to come. In choreographer/dancer Alice Gosti’s film The Unbreakable Ones—Hallie, dancer Hallie Scott spirals through sharply contrasting interior and exterior space: a sun-drenched landscape provides playful contrast to the high-gloss whiteness of Love City Love’s former perch on Capitol Hill. The defiance of the title and power of Scott’s movements are complemented by a sense of humor that serve the piece well. The quote Gosti chose for The Unbreakable Ones (from dancer Jan Trumbauer) elicited laughter from the Film Forum crowd: “Not a pack of fierce wild predators/ but a herd of fierce wild wider-eyed, flat-toothed, grumbling wide-nostril, vibrating, tail-tossing, big-flanked vegetarians.” The work, Gosti revealed, is the first chapter in what will become a 25 to 30-minute film of the same name in 2015. The evening’s most comedic offerings were the gravity-defying May & June by Rachael Lincoln and Lonesome Polecat, Sara Jinks’ reimagining of the song and dance sequence in “Seven Brides for Seven Brothers.” Both comedies are also notable for being the evening’s strongest ensemble pieces; they employed deft dancing, cinematic acting skills, and physical comedy to tell the story of lonely, pining siblings. Through the eyes of Lincoln and Jinks, respectively, the American West is primed for navigations of the body, heart, and spirit—but it isn’t above poking fun at itself. In addition to the December 8-9 showcases featuring Seattle artists, two more programs featuring longer films by European and African dance artists were screened on Saturday, December 13, at the Northwest Film Forum. On Sunday, Velocity will host a Speakeasy event, Identity Riot, examining “the New West from the perspective of feminism, riot grrrls and African-American and Filipino-American dance culture.” The performance component of Next Fest NW also runs at Velocity Dance Center through the weekend (Dec 12-14) at 8 PM each evening.